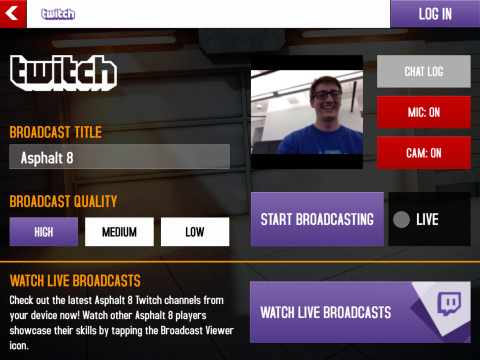 SAN FRANCISCO--(BUSINESS WIRE)--Twitch, the world’s leading video platform and community for gamers, today announced that Gameloft’s Asphalt 8: Airborne for iOS will be the first ever mobile game to feature Twitch’s live streaming functionality. Gameloft will demonstrate the game’s broadcasting capabilities during the week of the Game Developers Conference with a 24-hour live stream event on Twitch. Published by Gameloft, Asphalt 8: Airborne is an award-winning mobile arcade racing game where players race against the A.I. or real world players, while performing dynamic, high-speed aerial stunts. With more than 48 million installs and a hard-to-achieve 91 Metacritic score, including perfect ratings from several top media outlets, it is the ideal game for introducing live streaming to the mobile games market. 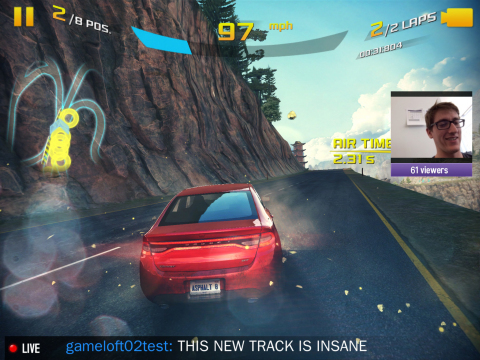 Beyond broadcasting gameplay to the player’s Twitch channel, Asphalt 8: Airborne’s Twitch integration unlocks the door to a host of interactive functions. These include the ability to stream your voice and image using your iOS device’s microphone and front-facing camera, and to monitor chat from people viewing your stream. Players can also archive their streams and share them on the Web, or discover streams from other Asphalt 8 players from within the app. To showcase this mobile gaming innovation, Gameloft will be hosting a 24-hour live stream event during the week of March 17, 2014 on their Twitch channel: http://www.twitch.tv/gameloft. The broadcast will feature a walk-through of all the streaming options, interviews with the development team, giveaways every three hours, and a Q&A session with Twitch viewers. Stay tuned for more details on the exact time and date. Twitch functionality is currently optimized for iPhone 5S, iPad Air and iPad Mini with Retina Display, and will be live as part of Update #3. This update includes brand new events and cars, as well as a new area and user interface, all of which will be available soon on the App Store. For more information on Twitch, visit our press center and blog, and for more information on Gameloft and Asphalt 8: Airborne, visit: https://itunes.apple.com/us/app/asphalt-8-airborne/id610391947?mt=8. Twitch is the world’s leading video platform and community for gamers. More than 45 million gamers gather every month on Twitch to broadcast, watch and chat about gaming. Twitch’s video platform is the backbone of both live and on-demand distribution for the entire video game ecosystem. This includes game publishers, developers, media outlets, industry conventions and press conferences, casual gamers and gaming for charity events. Twitch also caters to the entire esports industry, spanning the top pro players, tournaments, leagues, talk shows and organizations. Learn more at http://twitch.tv. A leading global publisher of digital and social games, Gameloft® has established itself as one of the top innovators in its field since 2000. Gameloft creates games for all digital platforms, including mobile phones, smartphones and tablets (including Apple® iOS and Android® devices), set-top boxes and connected TVs. Gameloft operates its own established franchises such as Asphalt®, Order & Chaos, Modern Combat or Dungeon Hunter and also partners with major rights holders including Universal®, Illumination Entertainment®, Disney®, Marvel®, Hasbro®, FOX®, Mattel® and Ferrari®. Twitch has partnered with Gameloft to release the first ever mobile game with live streaming functionality built into the game client. Asphalt 8: Airborne is the debut game with this feature.